Dante Alighieri (1265-1321) was a late Medieval or early Renaissance poet, born to a prominent family in Florence, whose most famous work is the Divine Comedy. The Italian town of Florence was considered the cradle of the Renaissance by 1425 (partly due to Dante's work), but Venice and Rome became just as successful by the early 1500s. Dante was politically active, part of the physicians, apothacaries, and book dealers guild and later one of the 6 priors of Florence. Florence was divided into factions, the Papal Guelphs, the “Whites”, with Pope Boniface VIII, and the Ghibellines, the Holy Roman Empire party, the “Blacks”, with King Philip of France and later King Henry of Luxembourg. 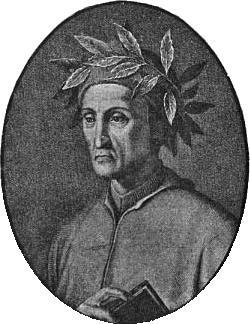 Dante was exiled from Florence about 1302, living with sympathetic patrons for the remainder of his life. It was during this exile that he traveled, studied philosophy and theology, and wrote several works, including The Divine Comedy. Dante wrote his most famous works in the Italian language of the time (the vernacular) rather than Latin, revolutionizing the common language intellectually just as Shakespeare would for English several centuries later. The Vita Nuova is an early collection of love poems inspired by Beatrice, a woman whom he adopted as his muse. Dante later described the path of a soul to salvation in "The Divine Comedy," in which Dante travels through Hell (Inferno), Purgatory (Purgatorio), and Heaven (Paradiso). In this journey, Dante is first guided by the Roman epic poet Virgil, and then by the soul of Beatrice, who had died young. This page was last modified on 7 April 2017, at 15:48.